On April 2lst Chicago Cubs ace Jake Arrieta hurled his 2nd Career No Hitter. It was his second "no no" in just 11 starts and added yet another stamp to an amazing streak of dominant pitching by the 2015 Cy Young Award Winner. 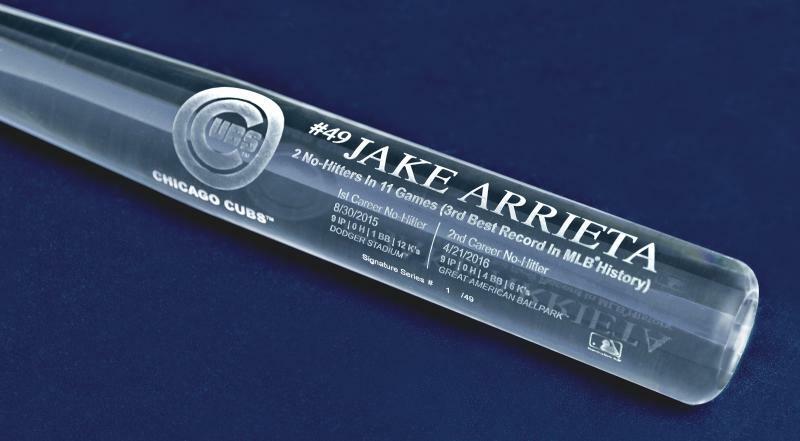 To honor Arrieta and his unique achievement we are proud to offer this uniquely beautiful Translucent Bat commemorating his two, no-hit performances. This all acrylic bat features a fine, crystal-like appearance and is laser etched with the details of both no-hitter games and the Chicago Cubs logo. This is a limited edition collectible. Order yours today before they are gone. Due to the limited release of this item we must charge your credit card for the full price immediately upon taking your order. This policy ensures we reserve a bat for you. We will confirm your order by email.